Hey Y'all - Time to start planning for 2010. This will be year 11 above the timberline in the San Juan Mountains for Krista and I and we enjoy your company on the trails up there every summer! Plan to be checked in to the KOA by Tuesday evening (July 20) because we start hitting the trails Wednesday morning. 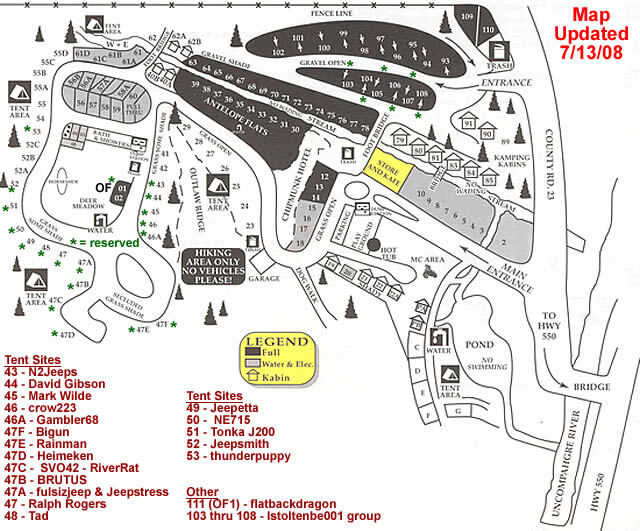 We have set aside some tent sites at the KOA again. 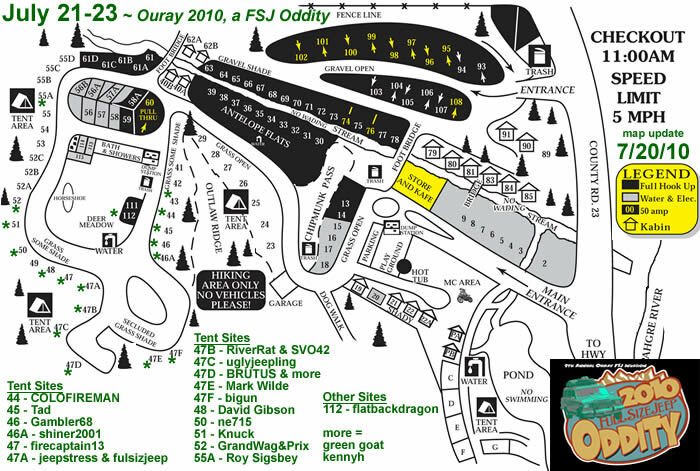 They will be held open for FSJ Invasion attendees until at least the end of December 2009. Please remember: if you cancel less than 48 hours before your arrival date, you pay KOA for at least two nights. Your bill with KOA is your responsibility. Here is the KOA web site: OURAY KOA We recommend you reserve your KOA site by contacting Dave by email or call 1-800-KOA-8026 and ask for Dave. The office is open 8AM to 10PM until Labor Day. When you contact the KOA, tell them you are with the Full Size Jeep Group (not FSJ group). I think we were supposed to be in 47B, I'll email Dave again. We reserved our site for Sunday night until the following Sunday morning, we'll see what happens... I'm ready for a do-over!! Last edited by RiverRat : 07-29-2009 at 10:37 AM. Dang, who has 47B? I was trying to be quick and get a good site next year! That's where Ralph usually grabs. I may rent a trailer from Montrose. Anyone want to make a few bucks and pull it to/from the camp for me??? I may have screwed up then. I had Dave reserve 47 for us thinking that's where we were in 2008. We can switch with someone if that's a problem but Dave confirmed for us yesterday afternoon that Tad = 47 for July 21-23, 2010. You and Em were in 47 the last time you came up. Ralph has been in that spot before as well. Last edited by Jeepstress : 07-30-2009 at 07:28 AM. Don't think it makes that much difference but you were in 48 last year Tad. This is first come first served type stuff. Negotiate your camp spots and use a beer can for a wheel chock. Kinda wanted 48, as I recall it has more open space and I'll be converting my welder trailor for hauling, so I don't have so much crap in the rig. I have been wanting to try to make this for a few years now. Now the wife really wants to go. We would have to drag the kids along also. lol But there is no way the wag will be ready in time. Our best shot is for me to get this thing finished up to go. It will have my wags old axles so it will be just like a FSJ (any part I can get cheap is put into it) (has a Ford drive train). I have 2 projects to finish in front of it. So if I can get those done and make some real progress on this I will reserve a site. About how long untill the sites start really filling up? I remember in past years they can go quick but when does the rush really come? I think Erica is sufficienty hooked on the Ouray experience. We will be back! Next year I am going to try and get the BluGa Whale down there as well so I can do Blackbear. Mike, I will tow it for you. No worries. About how long untill the sites start really filling up? I remember in past years they can go quick but when does the rush really come? We try to get people motivated to reserve before Christmas. After Jan 1, Dave opens the sites up to anyone to reserve them. i called today, I am actually in 56A, someone else grabbed 56. See what I can get done before Christmas. It is EFI, has new breaks, and it has a low range. This year I had 47B cause Rainman took 47. Then they couldn't make it so I got 47 and 47B. Then decided to give 47B a try and let Casey have 47. I know. The 3 years before that I had 47. Tad - So if you want to trade I can get 48 for those days and get 47 for the 18th to the 20th and we can trade those days then? again? Quick, what are you doing on July 22, 2010? Bonus question which are you doing right now?? My answers are hopefully A and or C, and right now E.